In Tunis thousands of people flooded the central Habib Bourguiba Avenue, close to the tree-lined boulevard, where violent anti-government protests were raging two years ago, when the so-called Arab Sprig was ignited. Flocking to the Interior Ministry office, protesters were chanting "The people want the fall of the regime!" As an ambulance carrying Belaid's body was driven in front of the ministry, hundreds of mourners crowded around the vehicle. Calls for a second revolution were heard from the crowd. The protesters were chanting “We are all Chokri,” “O Chokri, O martyr, we will follow your path," and “Terrorism, bullets, Tunisians are fearless”. Police responded to mass gathering in Tunis with teargas and warning shots. One officer has already lost his life in a violent clash with the people. There have also been reports that an ambulance was teargased. 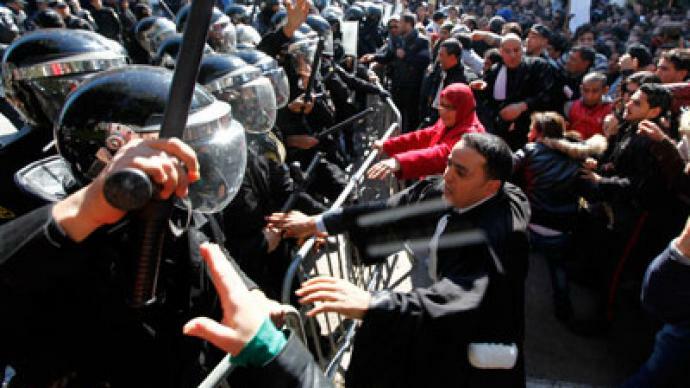 Further protests have erupted in more than 12 towns and cities across Tunisia. Rubber bullets and tear gas were also used to contain the crowds in Sidi Bouzid, central Tunisia, the birthplace of last year’s revolution. 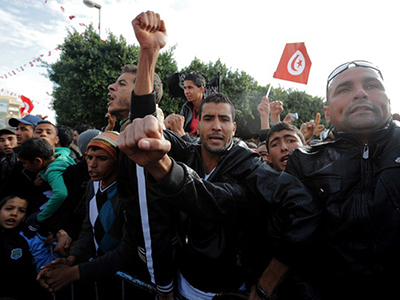 Some 200 protesters attacked the police station in the central town of Sidi Bouzid. Police had to fire teargas to force the crowd back. Angry crowds set fire to or vandalized HQs of the ruling Ennahda party in the capital Tunis and in several cities around the country. Amid raging mass protests, the Tunisian opposition has announced in a statement the suspension of its membership in the constituent assembly. 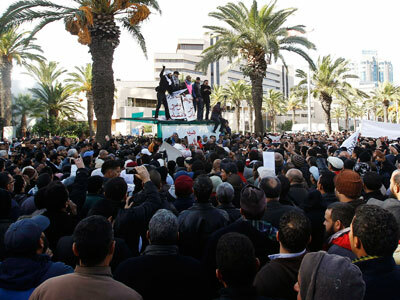 It has also called for a general strike on Chokri Belaid’s funeral. Four opposition parties have followed in their steps and announced the suspension of their membership in Tunisia's constituent assembly as well. They have also joined calls for a strike to protest the assassination of the prominent leader. Later Tunisian prime minister said he was going to dissolve government and form a national unity cabinet consisting of non-partisan technocrats. ­Chokri Belaid, 47, who was leader of Tunisia’s Democratic Patriotic Party, was killed as he was leaving his house in Tunis, the country’s capital, according to the county’s Interior Ministry. Belaid reportedly took four bullets to his head and chest. Shortly after the shooting, Belaid was rushed to a nearby medical clinic, but the injuries proved fatal. There have been reports about “three men in a black vehicle” had been present at the scene. However, the latest statement from the Interior Minister said that killer of Chokri Belaid is believed to be a middle-aged man on a motorcycle that was ridden by an accomplice, Reuters reports. The Interior Ministry said after the shooting the attacker and rider sped away. No responsibility has been claimed so far, but protesters and supporters of Chokri Belaid, who had recently formed a coalition in opposition against the Islamist-led government, blame members of the ruling Ennahda for assassinating country’s prominent opposition leader. The Ennahda has said it had nothing to do with the assassination of Belaid, Reuters reported. ­The Ennahda came to power following the 2011 revolution when Tunisia’s long-ruling leader was ousted. The Islamist party has been widely accused of seeking to monopolize power. “Ennahda bargains and claims to want to expand the coalition, but refuses to cede any of the key ministerial portfolios sought by opposition,” an anonymous Western diplomat told AFP. The country has been waiting on a ‘long overdue’ cabinet reshuffle. Belaid recently spoke out against alleged attacks by the Islamists, targeting his party’s members, stating that, "a group of Ennahda mercenaries and Salafists attacked our activists.” The attacks reportedly occurred as a party meeting drew to a close last Saturday. There have been tensions over the role of Rashid al-Ghannushi, the so-called ‘spiritual leader’ of the Ennahda Movement, which is currently the ruling party in Tunisia. In October 2012, clashes took place in the southern city of Tataouine, during which the coordinator of Nida Touns political party, Lofi Nakd, was killed. Tunisians suspect that Ghannushi might have been behind such radical actions against political opponents. The fact that his son-in-law is the country’s foreign minister could also be fanning the flames of protest. “The fact that the members of the family of the spiritual leader of this Islamic ruling movement have prominent positions of power is one of other things that makes even people who supported the general tendency say “all we are seeing are revolutions to get rid of the Ben Ali family only to replace it with a new ruling family,” professor of international relations at Bilikent University in Turkey, Mark Almond told RT. 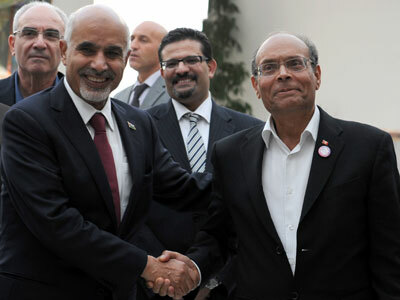 Tunisia’s President Moncef Marzouki canceled a foreign visit following the news to return home. He denounced the “the odious assassination of a political leader who I knew well and who was my friend”. Asma Belaid, Chokri’s wife, told reporters his death is a catastrophe for Tunisia and their family. French President Francois Hollande has expressed great concern over the escalating political violence in France’s ex-colony. “This murder deprives Tunisia of one of its most courageous and free voices,” Hollande's office said in a statement. Protests have also been spotted in Paris near the Tunisian embassy, AFP reports. Some protesters even managed to get into the building. Two years ago Tunisia was the first country to overthrow its leader, following uprisings throughout the country, in what came to be known as the Arab Spring. The country has been gripped by social and religious uncertainty following the introduction of subsequent free elections, yet has managed a smooth transition to democracy up until this point. “There hadn’t been too much of violence, but unfortunately with these deep disappointments with the failure to make life better (life has got worse) and the sense that a trajectory that takes many people in Tunisia away from what they wanted,” said Almond. ­Tunisia is fast becoming a microcosm of the Middle East, where the dichotomy between an Islamic regime and the predominantly secular opposition is magnified – especially after this recent assassination, believes political analyst Danny Makki. He claims that in the current era, the Arab world is so completely politicized that even a minute change can spark hatred and mass outrage. And because Tunisia's current Islamist regime is supported by Salafists, it has strong links to other Muslim Brotherhoods, further widening the country's ideological rift. President Marzouki, for instance, is a firm supporter of the so-called Syrian Jihad. “[Belaid’s] assassination was committed by people with close links to the government, though they deny it”, Makki told RT. Makki told RT that the latest events are testimony to the backwardness of the Arab Spring in Tunisia and the Brotherhood's inadequate leadership, which has no tangible political policies or social and economic programs.